Among the trending news of the moment on the internet is the selfie taken by the president Obama at Mandela’s Memorial service, together with Denmark’s Prime Minister Helle Thorning-Schmidt and the Prime Minister of the United Kingdom, David Cameroon. The photo was posted on the Twitter account of the newspaper New York Post and it shows President Obama taking the shot with a Smartphone. President Obama has declared in the past that because of security reasons he doesn’t have an iPhone. It is unclear who the owner of the Smartphone was. Probably it belongs to the Denmark’s Prime Minister Denmark’s Prime Minister Helle Thorning-Schmidt who can be seen holding the Smartphone. Maybe President Obama was just lending a helping hand. 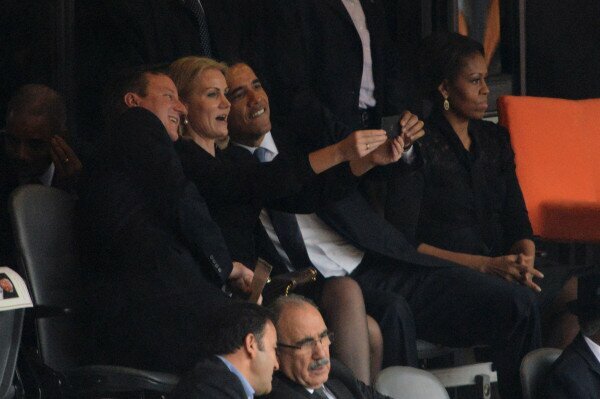 The fact that Obama takes selfie at Mandela’s service is somehow awkward. The selfie is the symbol of everything wrong with our society, our internet, and our teens. For a funeral service, the selfie is a tragic irony reminding us of our connected age. The photo was added to the Tumblr “Selfies at Funerals’’ that is a collection of images from Twitter, Facebook, and Instagram showing oblivious teens, posing for their iPhones at funeral services. In the recent years the act of taking selfies has become increasingly popular. A selfie is defined as self-photo, a photograph taken of oneself with a webcam or a Smartphone and uploaded to a social media network. In a way, the selfie taken by President Obama is not as awkward as some critics would like us to believe. First, it is not clear that the President was the one who was taking the selfie and it appears more credible that it was the mobile phone of the Danish Prime Minister Helle Thorning-Schmidt. Second, it wasn’t technically a funeral service but a memorial service for the former President Nelson Mandela. Besides gossip, from a political point of view, more intriguing is the photo of President Obama shaking hands with Raul Castro, the brother of Cuba’s President Fidel Castro who has been an enemy of the US for long.